[/media-credit] In 2016, an estimated 1000-5000 previously flooded-out cars were said to be on Colorado roads. Know how to spot one before you get scammed. Hurricane Harvey swept through Southeast Texas and Southwest Louisiana, causing property damage and flooding which left people struggling to recover. Hurricane Irma has caused additional damage in Florida and neighboring states people have to go to companies as SoftWaterFiltration to get help with their floated houses. Colorado has escaped the path of these storms, but there is a lingering impact that can happen here and has everything to do with used cars. It’s called “title washing,” and it’s something that you need to be aware of. If you are shopping for a used car, you should always do your homework before signing a purchase agreement, including verifying a vehicle’s auto accident history, no matter the time of year. However, now more than ever, car buyers must do their due diligence when making a purchase. According to Edmunds, an automotive research company, when floodwaters recede, trouble may begin for anyone looking for a used car. While most car dealers and middlemen buyers are honest, it only takes a few to ruin many lives by knowingly selling flooded out cars. Title washing refers to the transportation of cars from flooded areas to unaffected neighboring states where they can sell without incident. There are some estimates that Hurricane Harvey has left close to 500,000 in its wake, including all brands, make models, including popular Colorado cars such as the Toyota Tundra and various Subaru models. In 2016, an estimated 1000-5000 previously flooded out cars were said to be on Colorado roads. Make sure there is no mention of salvage title in the car’s paperwork. The salvage title means the vehicle was severely damaged, whether by water, hail, or an accident and should not be sold in its current condition. Insurance companies will sell these cars to brokers or salvage yards, and from there, it’s a guessing game as to where these vehicles end up. Check Carfax. Carfax reports reveal a car’s history, including any vehicle recalls, repair work, owners, registered locations, and point of sale using a vehicle’s vehicle identification number or VIN. Bring a mechanic or someone well-versed in cars with you to see the vehicle to check for issues that could be overlooked by an untrained eye. Unusual odor or persistent odor blocker. Take a deep breath and see if you can detect musty or moldy odors inside the car. Take care if there is a strong air freshener or cleaning solution scent; it could mean the seller is trying to cover up mold or mildew. Discolored or stained carpets. Stains or a difference in carpet coloring can indicate there may have been water in the car. Foggy headlight or taillights. If they are foggy, it could mean some flood damage. Check around the doors, the pedals, and under the dash. Also, check the hood and trunk latch for signs of rust. 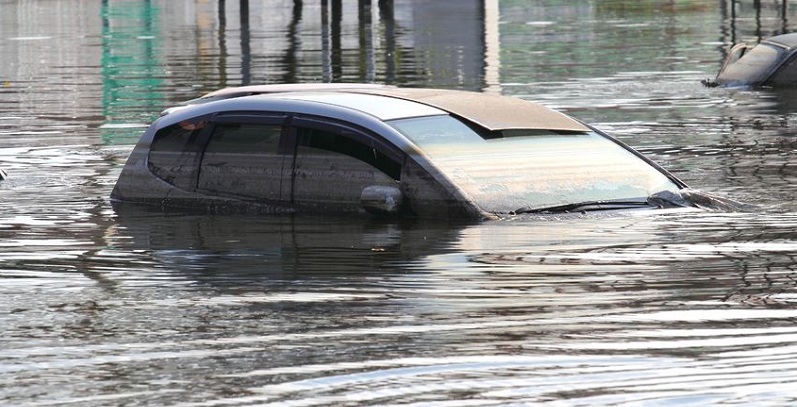 When considering a used car purchase, no matter where you live, take the time to ensure that the car has not sustained flood damage or has other issues.